There are two alternative methods for installing OCI8 via PECL. I tried both while attempting to get things properly configured on my system. Both methods do the same thing - except that method 2 allows you to choose an earlier oci8 version in the event that the current one seems not to be working. This first method is easiest, using PECL to automatically download and build the OCI8 extension. Although its a fairly involved process it’s all scripted and managed by PECL - and is initiated using the simple command. A series of automated checks will flash past in your terminal screen as PECL checks your environment and prerequisites - then performs the build. In my case, a few minor warning messages were displays about items in the source code - but these looked safe to ignore and didn’t interfere with the build process. This is a slightly more manual variation of method 1. However, it has the advantage of allowing you to choose specific OCI8 versions depending on the package file you download. Untar the package, extracting it anywhere you like. Open terminal. Go to the directory containing the extracted package, and execute the four command lines below. These essentially execute the run process as the pecl-managed install in method 1. Substitute /path/to/instant/client/lib with the path to your ORACLE_HOME (Instant client) directory as per Method 1 above. the build should still complete successfully. With the build complete, you need to update your php.ini file to ensure the new OCI8 extension is included in your configuration options. If you’re already using PHP then you’ll likely already have the php.ini - but if you’re not actively using/configuring PHP on your Mac then this may be new territory. If you don’t already have your own custom php.ini file, create this by copying the default version. Go to the Dynamic Extensions section of the php.ini file. This starts at line 834 in my version of the file. This is the standard Unix (and Mac OS X) format for adding a PHP extension. Save the updated file, then exit. It may also prove useful to update the permissions on your php.ini file. In his PHP setup article, Rob Allen (see references below) recommends applying the following changes. If you haven’t yet configured PHP on your system, refer to the documentation on PHP.net for making use of OS X’s bundled PHP functionality. This is the step missing from most other documentation for OCI8 installs. I’m not sure of the technical details - but after some Internet searching and experimentation I discovered that it was needed for PHP to recognise OCI8 on my system. The org.apache.httpd.plist file needs updating to reference the DYLD_LIBRARY_PATH variable. The value should be set to the path of your Oracle Instant Client home. Because the file format is XML, you need to make TWO entries. The variable name, DYLD_LIBRARY_PATH, must be enclosed between the <key></key> tags. The variable value must be enclosed between the <string></string> tags. The change is illustrated in the image below. Save the updated file and exit. This is will display the global configuration settings for PHP, as well as the settings for each module. The output should include details for the OCI8 module similar to that shown below. A better option is to create a php page in your apache web documents folder calling the phpinfo() function. When viewed in a browser, this will display the full configuration of your PHP install (including the OCI8 module if properly configured) in a much more readable format. If you have an Oracle database available, you can further verify the installation using a simple PHP script that connects to a database and calls the Oracle sysdate function as below. Make sure to change the database login and other connectivity details to match your system. Rob Allen - Setting up PHP & MySQL on OS X Yosemite. Although targeted at a different database, and not including OCI8, this article provides a good summary of the required PHP and Apache configuration. PHP.net - Using the Mac OS X bundled PHP. More detail info about configuration required to use the bundled PHP (and Apache) version on your Mac. 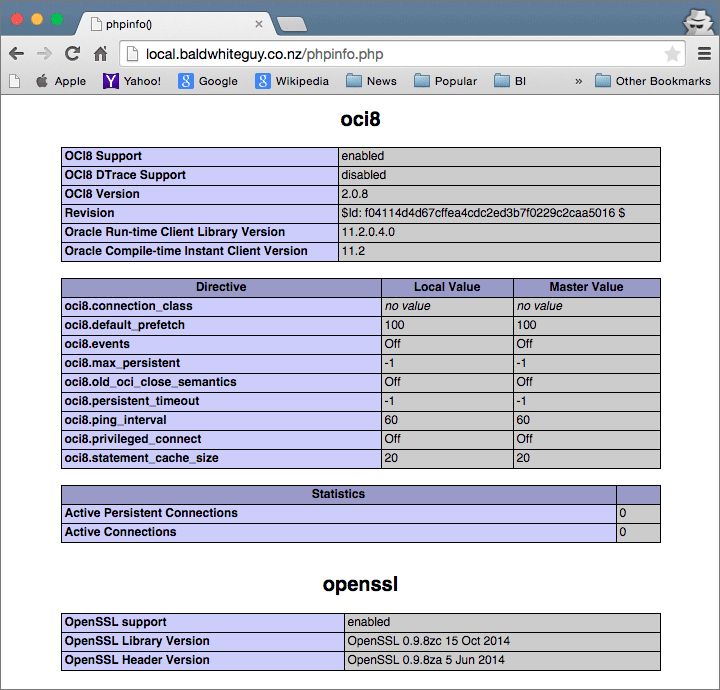 Enavigo - Enabling Oracle OCI8 PHP Extension on OS X Snow Leopard. Although out of date, it provides a good overview. 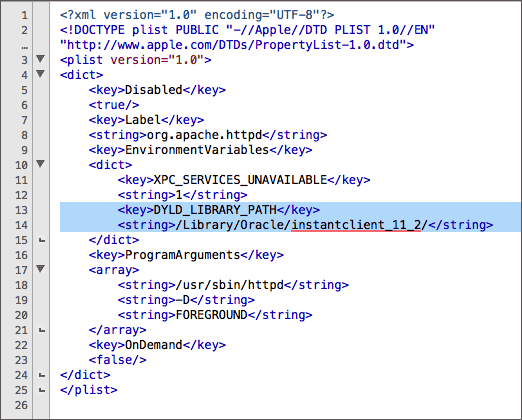 Deptz - How To Enable OCI8 on PHP 5.4 and Install Oracle Instant Client on Mac OS X 10.9 Mavericks. Another good article that helped me figure things out … including the missing step to update the httpd.plist file. PHP.net - Oracle OCI8 Manual. Official reference guide for PHP and OCI8. Christopher Jones and Alison Holloway - The Underground PHP and Oracle Manual. Another useful reference guide to anyone beginning PHP development with Oracle. In my notes for the installing the OCI8 module, I stated that a manual download from pecl.php.net/package/oci8, then calling the phpize and ./configure commands (see Step 2 above), was the only way to install an older version if you needed to. I'm a Business Intelligence and Data Warehousing consultant based in Brisbane, Australia. 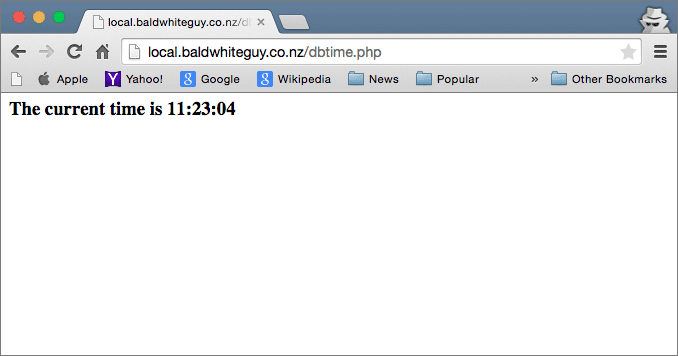 I've consulted on or managed several large BI systems in New Zealand, Australia and Latin America. Old-timer with a machine gun. 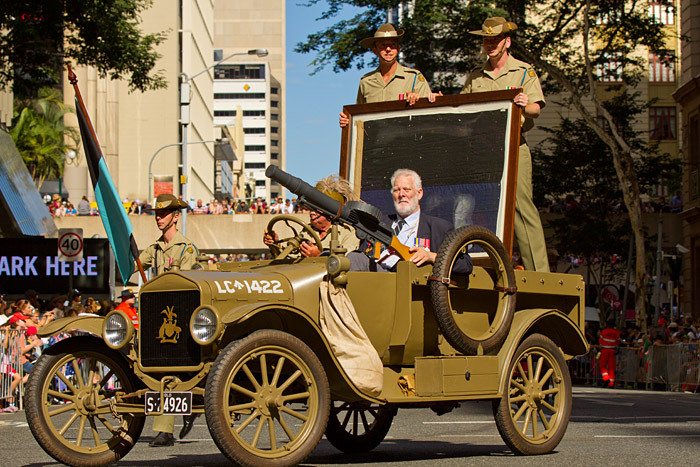 Vintage War truck in 2015 ANZAC Day. Flag with original Australian (and ANZAC) colours is held in the background.